These numbers refelct the best info available, which isn’t saying much. Police killed in the line of duty as tracked by the Officer Down Memorial Page, and includes officers killed in auto accidents–26 last year. Since they do not parse who caused the accident, I included them. Civilians killed by police tracked by Killed By Police Facebook page–I know, I know, a Facebook page doesn’t sound credible but this is more reliable than FBI statistics, which reflect only “justifiable” homicides. 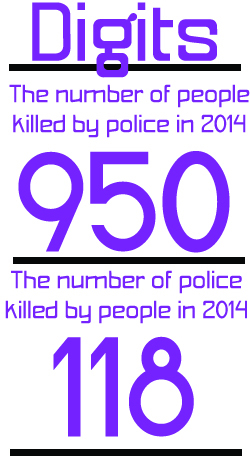 For more on the lack of stats, visit this Five Thirty Eight post on police involved killings. Was this purely informative or are you suggesting that the numbers should be more even? I know that things aren’t always right. Indeed, I am assuming that your experience with law enforcement gives you the impression that they are often dirt bags or worse. But, the people that police are generally killing are those who bring danger and/or lawlessness to the people they are around. The police that people are killing are generally those who are legitimately trying to uphold the law and disrupt crime. Therefore, I am personally glad that the numbers aren’t 50/50 between “good guys” vs “bad guys”. Not advocating for violence, but then if the “bad guys” aren’t going to be taken peacefully, then a peace officer’s got to rise to the level of threat that they’re facing. Even those numbers you’re providing, if we’re accepting them, aren’t suggesting that there were 950 unjust, execution-style, murders of completely innocent citizens just being bullied and picked on by a-hole cops. I don’t think anyone’s trying to suggest that’s what happened 950 times in 2014. The statistics indicate that about half if thos 950 were unarmed. A numbet if high orogile cases involve people that ate unarmed amd NOT in thr process of committing a felony–Garner, Brown, Bell, walmart airsift shooting, Tamir Rice. You commemt assumes these are “bad guys” and cops are good guys whi have the right to execute cotizens without the right to habeus corpus. Are you suggesting tjat people who commit crimes cam be executed in the street without amy legal process? Ifso i submit that they are wrong too often for that to be acceptable. I don’t think they have the right to execute where it’s unjust. If the person is acting suspicious, isn’t cooperating, presents a danger, then the police officer is supposed to subdue. (Non-lethal HIGHLY PREFERRED) But if the suspect is using lethal force, then it’s not joking around time. Officers are instructed to keep control of a situation. In no way am I saying that it’s ok for officers to use lethal force where it’s not reasonable to. I think the major difference of viewpoint is that I am more quick to assume that a given officer is doing right, and conversely, that a suspect is doing wrong. You are more quick to assume that the officer is dirty or abusing his/her power. Why would an officer have been sent on a call if there wasn’t someone who informed of some wrongdoing ? or from a peace officer having seen wrongdoing? People are sick and tired of the bad examples. (Tragically bad, at that!) The bad examples are the ones that hit the media. But it is my experience that those tragically bad examples are the vast minority of peace officers. I know that doesn’t really help Garner, Brown, or Bell… but it feels like a baby and bathwater situation. I work for an organization whose mission statement is: to continually enhance the professionalism of California law enforcement in serving its communities. We’re a gov’t organization and we deal with budget cuts all the time… but especially in a time such as this… with the public view of law enforcement as it is… wouldn’t you think that an organization such as this shouldn’t routinely have its budget cut? If anything, we need to pour more into improving our law enforcement, community involvement, and best practices so that they can begin to regain the public’s trust. That’s my opinion. In closing, I believe we want the same thing. We want to feel safe. We want justice. Cops having a bad day and taking it out on a citizen… is not justice. We expect better. Brown had just committed a Robbery Second Degree, a felony in Missouri, and assaulted a law enforcement officer. Pretty sure that is not punished with execution under our constitution. No, it wouldn’t be, but he wasn’t “executed”. He was killed by an agent of the state and the justice system upheld that death. I don’t think that’s how any of us think cigar thieves should be dealt with.